A bronze tint to the upper leaves is a distinctive feature that helps separate Bugle from most other members of the Mint family. Stems have a square cross section, hairy on just two opposing sides; they bear pairs of opposite oval leaves that are unstalked apart from a basal rosette of leaves which have short stalks. 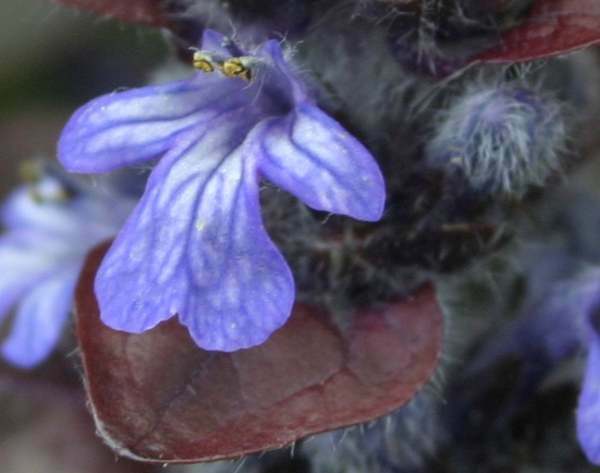 The blue-violet flowers are typically 1.5cm long and have a pattern of veins on the lower lip. Bugle can grow up to 20cm tall but is often little more than half that height. The plants propagate mainly by growing surface runners (which are known as stolons) that root at intervals along their length. Unlike its close relative Pyramidal Bugle Ajuga pyramidalis, this plant is common throughout Britain and Ireland and is found also across much of mainland Europe. Bugle prefers heavy, wet soils and forms large, dense mats in favoured locations. This attractive low creeping perennial wildflower thrives on woodland edges and in damp grassland. 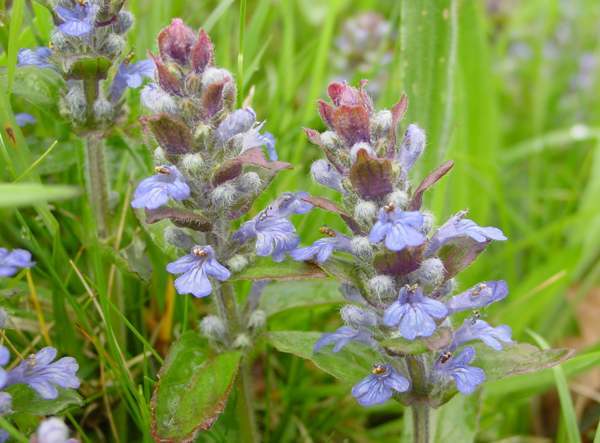 In Britain the first flowers usually appear in April, and Bugle continues blooming until late June or early July. The lips of the flowers are veined with darker blue. Although Bugle has been used in herbal remedies to stem bleeding, it is more important as a source of nectar for butterflies including the Pearl-bordered Fritillary Boloria euphrosyne, the Small Pearl-bordered Fritillary Boloria selene, the Dark Green Fritillary Argynnis aglaja, and the High Brown Fritillary Fabriciana adippe. Ajuga, the genus name, comes from Greek and means 'without a yoke'. The specific epithet reptans means creeping (like a reptile). The plants shown here were photographed in South Wales and in France in early spring.